The 300’ tall tower is a proposal for a commercial and residential addition to the historical structure housing the original 3030 Hotel. The site, 75'wide x 100' long, is located on a through lot in close proximity to Madison avenue. The existing hotel occupies the largest portion of the lot leaving a 20' wide strip where the "as of right" addition of the approximately 75,000 square feet has to take place. 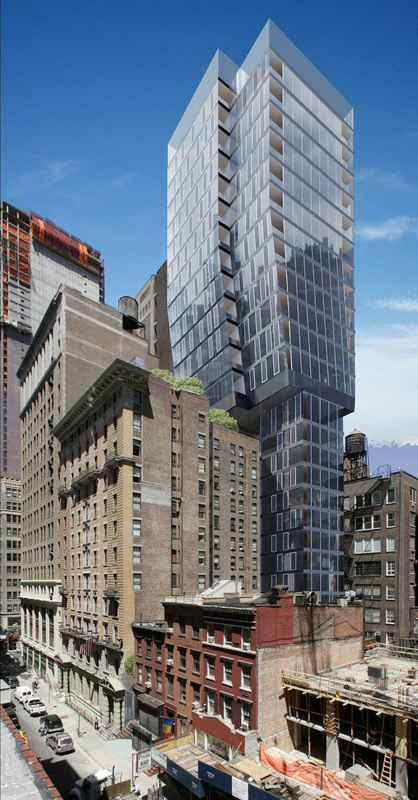 The proposal reinterprets the NY City Building code. Instead of building two highly inefficient sliver towers, subject to the sky exposure plane, the solution consists of a single tower in the middle of the lot, where the light and air are typically maximized. The form, rather than being arbitrary, makes the project possible. The shape of the building responds to the code requirement to minimize the impact on the existing light and air courts and by the desire to build the minimum amount of square feet at the lower levels, by cantilevering the upper floors beyond the main structure. TRA's design provides an elegant kinetic form that maximizes the floor plates for the premium upper units. The simple but dynamic form starts alongside the existing structure and then shifts slightly as to find its place on top of the old building, at once connected and separated, bent and vertical. This simple gesture interprets the context, engages the viewer, creates an identity of the whole, while simultaneously allowing for the easy differentiation of the building parts: the original hotel, the hotel addition, and the upper hotel or condo suites. The entry to the upper suites is on 30th street through an open garden court, providing a needed amenity to the complex. The distinct shape will be a sculptural recognizable addition to a midtown block composed by parts of very different character and scale.